Petloss.com > Categories > Rainbow Bridge Events, Parties & more... > where do we all live? My husband and I live in Silver Spring, Maryland just outside Washington D.C. I was born in Washington and have lived in my family home for 40 years. I lost Daisy in Nov. '07 and my baby Sherry suddenly on March 25, 2008. I have earth kids - Taco, Belucha, Carina, Stretch, Red and Phoebe. All of my cats were adopted from shelters or were abandoned by families around my neighborhood. I live in Lakeside, Ca. in the east county of San Diego. If anyone wants to chat, let me know. I live in a suburb of Minneapolis, MN. I grew up in Minneapolis but went away to college in Cincinnati, OH. I lived in Cincinnati for almost 10 years and then I moved to the Washington, D.C. area for about 5 years. I went back to grad school for a year in Minneapolis and that was when I found my beauty Blackie. Blackie had been a stray in the neighborhood I grew up in, so I knew we were meant to be together! :-) After I finished grad school I moved back to the DC area and returned to my old job. Then I found a new job in MN and have been back home for the past 1 1/2+ years. I've moved enough for a lifetime, have no plans on leaving the Twin Cities area and plan to live the rest of my life here where it truly feels like home. I'm from the greater Phoenix area ( a suburb of), but originally from New York State (the Hudson River Valley--beautiful area). I've lived in Bennington, Vt. for a while and we lived in Florida (by Vero Beach) back in the 90's. I'm sure I'll be moving again soon. My gypsy blood. I'm from Bel Air, MD. Lynn, where are you in Baltimore? I'm from Waterman, IL, a small little farm town 60 miles west of Chicago. I live on the farm where I grew up with my husband and my youngest daughter. My other two daughters both live within 5 miles. Since I grew up on a farm, I have always been around animals. I'm kind of an oddity though because I grew up in a family that raised cattle and hogs and I ended up being a vegetarian. Needless to say I fell in love with every animal I ever met. I could make a pet out of anything. I currently have 2 house kitties, Boo Bear and Bella and two dogs, Max, a black lab and Beauregard, a goofy, but lovable bloodhound. I lost my kitty soul mate, Gus, in December. Out of all the furbabies I've had, he is the one that my heart will forever ache for. I am from Summerside, Prince Edward Island ,Canada I want to thank all of my petloss family for all the help you have given me and I hope that I can give back as good as I have been given . 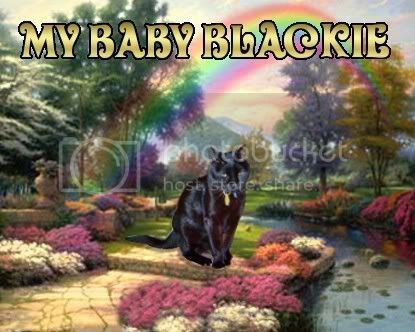 You are all so very Special to me My Mick meant the world to me and I would not have made it if it were not for you beautiful people at Petloss. Thank You all very much. Today it my Micky 6th Birthday so you can all help me sing Happy Birthday to Mick . I'm in Berkeley California.Ilive with my 13 year old daughter,my cat Muffin(my other cat, Willow,passed away unexpectedly last week near midnight) and a collection of turtles and tortoises...I LOVE them. does anyone else here have reptile pets? We live in Pennsylvania, in a suburb outside of philadelphia. I live in Brooklyn,New York. I live in Hicksville, New York. That is on Long Island not too far from Brooklyn. I live in Northwest Michigan. A little town called Cedar up near Traverse City. It's an outdoor cats life up here! Except now there are getting to be too many coyotes but oh well. We have always lived in Rockland. It's a great community. Wow there are people from all over here. I live right outside of New Orleans if anyone ever wants to hang out and cry. haha! I live in Pinellas Park, FL, not too far from Largo and Clearwater, Florida. I live in Manchester,Connecticut.I work in old saybrook,ct.We have a family cottage there.Long commute in the winter!! Beckywolf, I see you are in Largo, FL, I am close by. please chat back when you can. I would love to talk some more when time permits, It has been one week ago today that I lost my little best friend Toby, and I miss him so much. I know time will help and it will get better. Thank you all for your encouraging words and to Jerry for his wonderful sayings and poems. Oktaha, Oklahoma. Located between Muskogee and Checotah, Ok. Originally from Southern California. Came to Oklahoma after retired from military in 1995 so wife could be close to her parents.----Jerry in Oklahoma. Email me anytime....i would love to know more about your furbaby. I live in Los Angeles, CA. It's nice to know where everyone is from. I live in Richmond, Va. Mom to Woody and Solomon and several babies that have crossed the bridge. I am in South Carolina but not too far from Charlotte, NC. I live in Concord, NC just a few miles north of Charlotte. I live in Medford NY on Long Island! I live very near Tacoma, in Washington State. My address is actually in a small city called University Place. Hello Everyone! I am from Council Bluffs, Iowa. A place to enjoy all 4 seasons. Diana, Jessie and Neko's mom. I live in Western Massachusetts near Northampton. I'm in the southern suburbs of Chicago - about a 30 min drive. I did not see anyone else from here..We are in Rio Rancho , New Mexico . About 20 miles outside of Albuquerque...Originally from Altadena , California.